The Cable Center Customer Centric Consortium (C5) is a unique, invitation-only group focused on advancing customer experience in the cable industry. C5 members share customer experience strategies, operations, and leadership to help cable operators build and deliver the best possible experience for subscribers. There is no equivalent organization where business innovators and decision makers can learn and share best practices with customer experience thought leaders from within and outside the industry. The Cable Center has been at the forefront of the customer experience (CE) movement for more than a decade – through the James M. Cox Endowed Professorship in Customer Experience, the work of the Center’s Senior Fellows, and the Cable Center Customer Centric Consortium (C5). The vision has been consistent throughout – The Cable Center would become the home of thought leadership and research for the industry regarding customer experience, defining and developing excellence in customer experience management (CEM). The need for this focus is clear. Continuously improving the customer experience, cementing the loyalty of current customers, and increasing the appeal of cable for a new generation of consumers is a strong competitive advantage. The C5 initiatives have established a solid foundation on which to build industry best practices in this critical area. Learn the latest CE research including practical applications. Keeping up-to-date on the CEM thought leadership through access to white papers, articles, and studies. C5 meetings are informal and engaging: members openly discuss their challenges and successes. Members MSOs express the invaluable benefits gained from getting an inside look at the strategies and tactics used by other successful operators. C5 members willingly offer support, and collaboration, exchanging ideas to help advance opportunities, on both personal and business levels. C5 is interested in diversity of membership from all over the world so that we can all learn and grow. Current members include executives from among the leading cable operator companies in the U.S.A. (Blue Ridge Communications, CableOne, Comcast, Cox, GCI, MCTV, Mediacom, Midco, Spectrum Enterprise/Charter, Vyve Broadband); Canada (Rogers); Europe (Liberty); South America (Telecom Argentina (formerly Cablevision Argentina), Net Serviços Brasil), and Shenzhen Topway (China). Membership opportunities are expanding to include independent cable operators and cross-functional work groups such as sales and marketing, engineering, installation, service, and billing systems, etc., and industry associations – all with a focus on optimizing the customer experience across the entire industry. Check out our membership brochure to find out more about joining this exclusive group. C5 also partners with other key industry associations and sponsors to facilitate access to key information, education and collaborative opportunities. 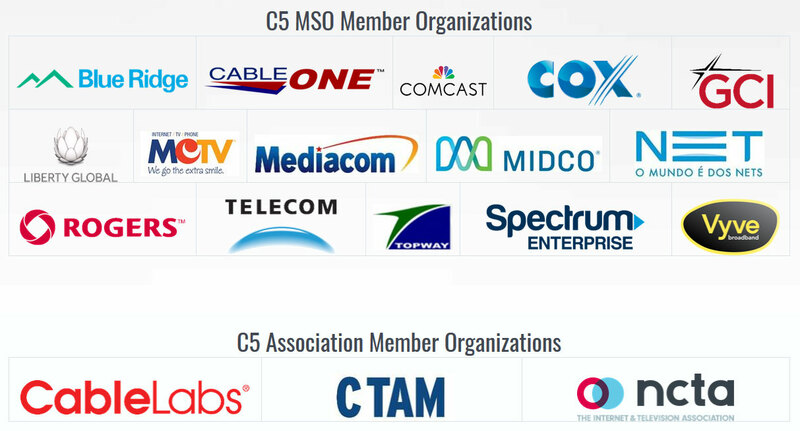 Partnerships with vendors and suppliers to the cable industry are vital to C5 for two key reasons: (1) C5 relies on the financial support provided by our partners to fund its efforts and help its members improve CX in cable, and (2) present operational and technological solutions for our cable operator members. This helps our MSO executives stay at the forefront of CX innovations and proactively identify resolutions for improving business processes within their organizations. Check out our sponsorship brochure for more information on becoming involved and how to support this exclusive group. C5 efforts are led by Dr. Charles Patti, The Cable Center’s Senior Fellow and James M. Cox Endowed Professor in Customer Experience, in conjunction with Senior Fellows Drs. Ron Rizzuto and Maria van Dessel. The Committee is supported by three Co-Chairs: Graham Tutton, VP, Customer Insights at Comcast, Andrés Piderit, VP, National Customer Care at Rogers Communications, and Scott Wise, VP, Contact Center Operations at Cox Communications. In addition to providing input on program content for the meetings, the Co-Chairs actively participate in discussions about the future direction and strategies of C5. “Contact Us” to find out more about becoming a member or a sponsor of C5!